Gov. 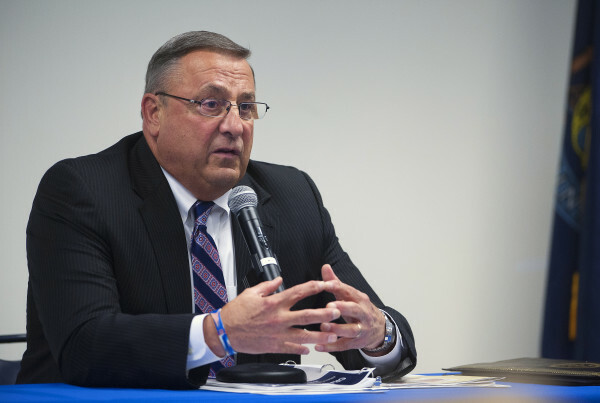 Paul LePage talks about his budget during a Town Hall meeting at the University of Maine Hutchinson Center in Belfast on April 28. AUGUSTA, Maine — Gov. Paul LePage’s recent move to further delay a round of nominations to Maine boards and commissions has drawn attention to the appointment process — normally one of a governor’s least controversial responsibilities. But it’s important: Maine’s governor has the authority to appoint more than 2,000 people to sit on more than 300 boards and commissions, from environmental protection to licensing boards to the Governor’s Council on Physical Fitness and Sports. Most of those are at the governor’s discretion, but more than 100 must be confirmed by legislators. On Monday, the Republican governor told MPBN that he won’t be nominating candidates for open positions until legislators return to Augusta in January, citing “too much hatred between the Legislature and the executive branch.” After “a cooldown period,” he said he’ll consider appointing judges, but he won’t consider other nominations. LePage spokeswoman Adrienne Bennett said that this only affects confirmable appointments. The office is still making personal appointments. Democrats have criticized LePage for his stance and he has used his appointment power to stall jail reforms that he disagreed with, but Bennett said that’s not his government-wide goal. The governor’s most recent move further ties up 21 confirmable nominations that he pulled in June, when he was mad at legislators who delayed a confirmation vote for his nominee to the Maine Public Utilities Commission. LePage can’t grind government to a halt immediately this way, even though hundreds of governor-appointed terms on Maine boards and commissions either have expired or will expire by January’s end. Still, some say that more delay could harm them in the long term. “I think we can say the longer this goes, the bigger the mess becomes,” said Mark Brewer, a University of Maine political scientist. LePage has used his appointment power to paralyze Maine’s jail system, but his office says that’s not his overall strategy for boards and commissions. There’s precedent for LePage using appointments — or lack thereof — for leverage: He stalled a 2014 jail reform law by refusing to fill vacancies on the Maine Board of Corrections, which was charged with implementing it. But Bennett said those were unique circumstances: On jails, she said legislators didn’t fix a “broken” jail system that shares state and county control, and she said LePage has “absolutely not” ordered commissioners not to attend meetings and they’ll be at them in the future. She said that LePage has appointed nearly 1,200 people as governor, outpacing his predecessor, Democrat John Baldacci, who appointed nearly 1,700 in eight years. “The governor does feel that this is important aspect of government and getting people involved,” Bennett said. But hundreds of LePage appointments are languishing and the longer that lasts, the more stress boards and commissions could be put under. By January’s end, 820 governor-appointed terms on state boards and commissions either will expire or already have, according to a document from the Maine secretary of state’s office. Of those, 114 must be confirmed by legislators. Three University of Maine System trustees are serving past their terms now, said spokesman Dan Demeritt. But that 16-person board also has one vacancy, which came when a member resigned after serving past her term. “I can’t believe that instead of fulfilling his duty to Maine people, Gov. LePage wants to argue over how much of his job he’s refusing to do,” Alfond said. Brewer, the political scientist, said the impact LePage’s move will have depends on how long he lets appointments languish: If it’s more than a year, it could be moderate, but if it’s the rest of the governor’s term, it could be “severe,” putting pressure on boards or grinding them to a halt. “Right now, only one person can tell you how that’s going to go,” Brewer said.